Making Life a Bliss Complete: Ho Ho Ho! 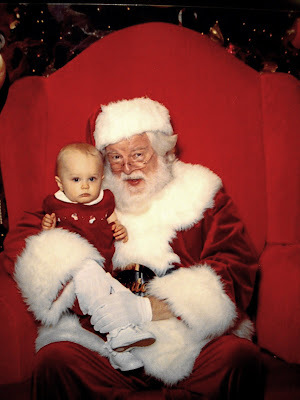 I took Tess on her first visit to meet Santa (or "Ho Ho," as Kate used to call him). I know it's early, but our playgroup went to get pictures done for a discounted group rate. And best of all--no lines! Tess wasn't too sure what to make of the bearded old man (yes, it was a real beard! ), but Ho Ho was very kind to her and she did like the white fur on his suit. She wasn't screaming, and she only looks semi-terrified in her picture. I'd call it a success! Good for you for getting in early!! I hope she gave Ho Ho a long list since she has been so good this year. More, More, More of the Morleys!